Hard Drive data recovery tool is a foremost solution to recover deleted, formatted, and corrupted data. Software Recovers data in Multi-formats; Video, Photos, Databases, Files, etc. If users deleted their data permanently from hard drive. Then They can recover their data instantly by using Hard Drive Deleted Data Recovery software. 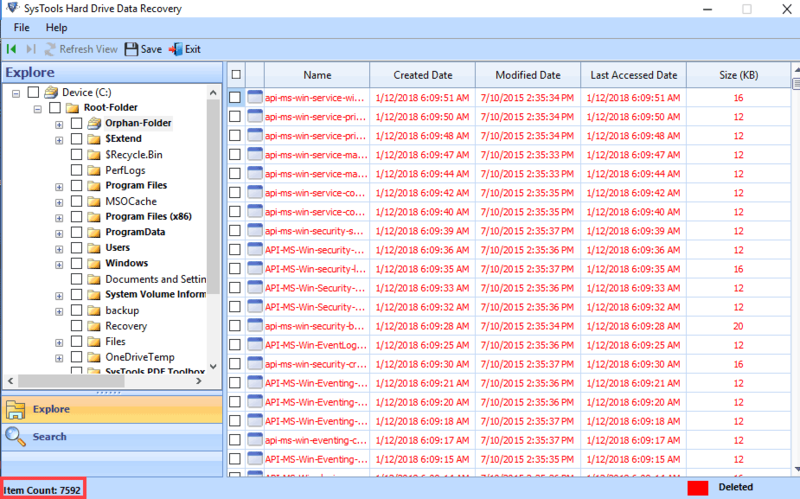 Tool is designed to recover permanently deleted (by Shift + Delete key) data from hard drive. Hard drive data recovery tool deliberately helps to recover damaged hard drive data belonging to both internal system hard disk or external hard drive. This tool supports all brands of hard drive like; Sandisk, Toshiba, LG, HP etc. It also supports all types of discs; CD, DVD, etc. Hard Drive Data Recovery Software offers two types of recovery options as: Scan: Recovers Deleted, and corrupted data files from hard drive. Formatted Scan: Recover formatted hard drive data with complete accuracy. Hard Disk failure can occur due to MFT or MBR file corruption which holds crucial information about files stored in NTFS or FAT File Systems. Hard Drive Data Recovery Software performs recovery of data due to MBR, MFT, or FAT corruption as well. 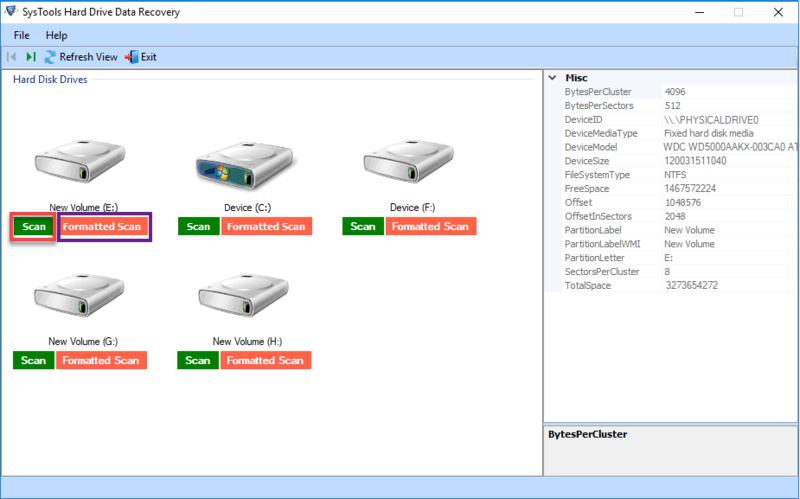 Hard Drive Recovery Software has a smart property integrated which automatically detects all the partitions available on any machine. Not only this, it also shows preview of these partitions along with attributes like; disk number, total size, partition type, etc. Hard drive data recovery tool is formulated to first scan the storage device quickly, load it, and then generate preview of the data which is recovered. The preview is shown along with attributes like; file name, creation date, modification date, etc. 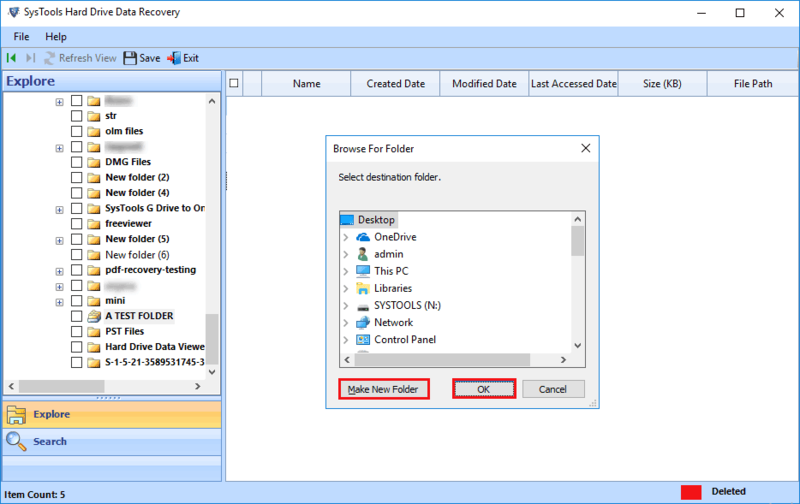 Hard Drive Recovery utility has a superlative search function using which one can easily search particular file or item within recovered data. Date Filters can also be applied to refine the searches by last modification or file creation dates. 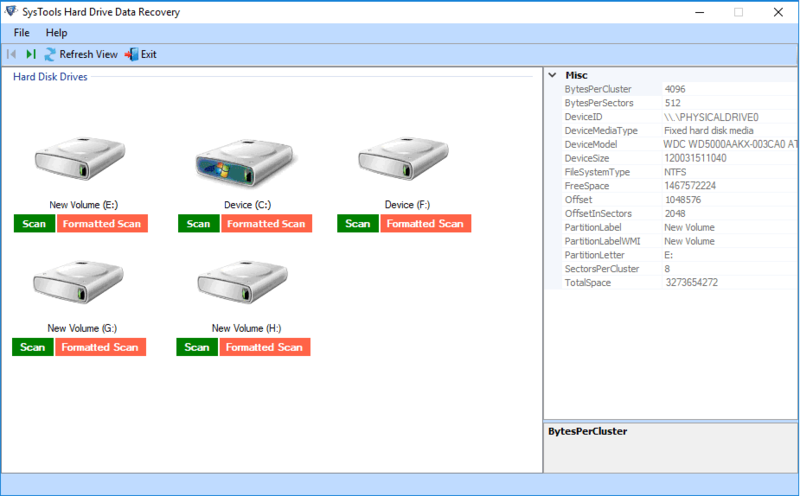 The Hard drive file recovery software allows previewing the recovered items and also allows sorting data based on its properties. Recovered data can be arranged in ascending or descending order as per its size, name, types, date of modification, etc. How Is Windows System Hard Drive Data Lost? Windows system hard disk data loss can originate from several issues. Some of them are caused because of accidental deletion, formatting, re-formatting, or corruption. However, corruption is most common scenario where Windows data recovery is needed the most. Usually when a system hard disk is corrupted, it prompts error messages while writing, transmitting, processing, reading, any file because of unintentional changes occurred in data or File System. When a hard disk is corrupted, either data is completely unavailable or it becomes inaccessible with unanticipated results. Prime Causes of Hard Drive Corruption! Improper Exists: Windows system improper handling like shutting down Windows incorrectly, accidental switch-offs, spontaneous resets, etc. can cause corruption in system internal storage drive. Offhand disconnection of external drives can also cause corruption. Malware Attacks: Virus intrusion is the most common cause of corruption. It causes severe damages by overwriting arbitrary areas of raw disk with garbage value. Some viruses also overwrite data through legitimate file operations which eventually causes data loss. RAW Disk Error: While accessing any partition, warnings are thrown like disk not formatted. Do you want to format now? Displaying your partition as raw. Such errors indicate towards severe corruption and recovering files from windows 7 hard drive becomes urgent. Internal Defect: Few time internal issues with File System or malware consequences can make your data completely disappeared or unavailable for access. This can happen to you in case File System of your Windows is badly hampered. 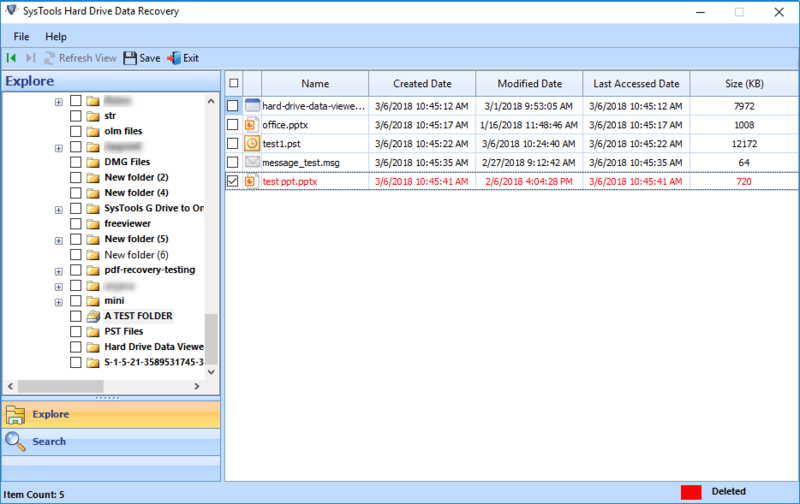 For severe damages in the hard disk or loss of crucial data, this hard drive recovery tool is recommended to recover data from a Windows system. Hard Drive Recovery Software can recover unlimited data and serves enhanced recovery technique through various integrated features. Step 1: Download and Install Hard Drive Data Recovery Software. Step 2: There are two types of scanning options i.e. Scan and Formatted Scan. Step 4: Display all folders in left panel after complete scanning. The software will highlight the folder which contains data. Step 5: Choose folder from left panel and view complete data in right panel of software. It also provides Item Count. Step 6: Now, Select those files or folder you want to recover and Click on Save to start saving selected files. Step 7: Select the location from the Browse for Folder window that appears and then, Click on OK to start Export Process. How Do I Recover Corrupted Data From Hard Drive with hard drive recovery tool? What kind of data can I recover from hard drive using this tool? 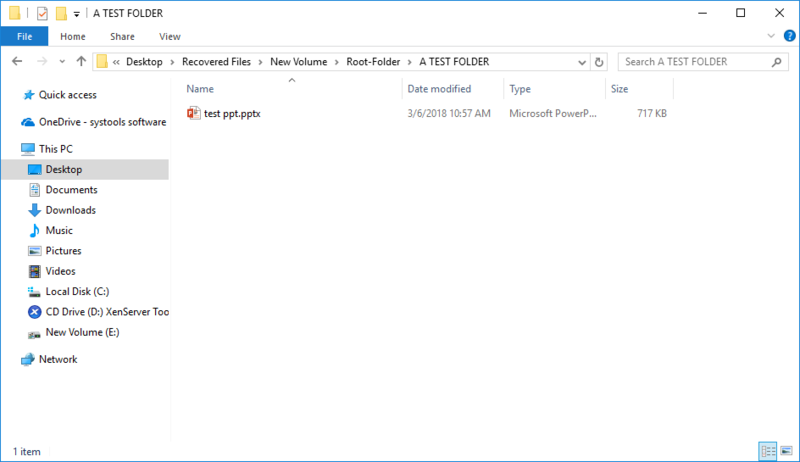 Yes, this tool can be recovered to restore permanently deleted data from Pen Drive that is FAT or NTFS formatted. Pen drive recovery for various brands is supported by the tool. I Can I recover music files from iPod using this Hard Drive Recovery tool? Yes, the tool supports recovery of iPod data. However, the fact that should be taken care is the iPod should be FAT32 formatted (which is default supported along with HFS plus). Do not reformat the hard disk of iPod with NTFS file system. On which version of Windows OS can I run this tool? This tool is developed for Windows Operating System only and thus it can be installed on any version of Win OS including the latest Win 10. Is it possible to recover permanently deleted data by using hard drive deleted data recovery software? Can I recover formatted data from Hard Drive? A big thanks to the QuickData team for the useful product. I have got all my data from formatted partition. The tool works magically well and its potential to restore deleted files makes my investment worth in it. I formatted official laptop to fix some errors. Mistakenly, I formatted all the partitions and all the data was gone. Thanks to this Hard Drive Data Recovery software; it saved me from huge loss. 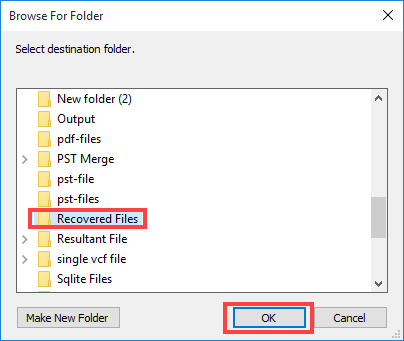 Deleted file recovery option in the tool is a savior. I recovered a presentation file that my child deleted accidently while using my laptop. Thank you so much for such a wonderful technology. 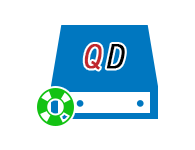 Recovering files from windows 7 hard drive was a bit difficult task for me, but thanks to QuickData team for providing such great Windows data recovery tool. The software is very easy to perform the repair process and provide accurate results after recovery.